This is an article in a series on using Aeroplan miles creatively to extract more value from them. My series on Aeroplan basics can be seen here. Aeroplan’s mini round the world hack is one of the best bargains in frequent flyer programs. The concept in question is to make use of the stopover feature combined with Aeroplan’s lax routing rules. Fly over the Pacific to an Asian destination and fly back over the Atlantic with a stopover in a European city. This is a great value and one of the best redemptions of Aeroplan miles. Let’s say you are interested in doing a round the world trip from North America to Asia to Europe and back. What you can do is book your ticket as a ticket to Asia, with a single stopover in a European city. If you are interested in exploring Asia, you can book internal flights in Asia separately. If you are interested in exploring Asia, you can book internal flights in Europe separately as well. Remember, any award ticket comes with 1 stopover (see the routing rules of the specific flights), so you can generate some more “stopovers” by buying internal Asia flights / internal Europe flights. Many of these flights will not be bookable online. As long as your 2 destinations are not in complete opposite directions from your origin, you should be fine. The Maximum Permitted Mileage (MPM) will dictate whether something is valid or not. When booking these flights, the phone agent should explain why any given routing might be illegal. Lets take a look at an example that can be booked with Aeroplan’s normal “round-the world” itinerary, assuming our home base is Toronto / YYZ. This will focus on going to Europe and China. To simplify this, let’s do the comparison for Economy tickets. Let’s also only focus on the mileage costs and ignore the taxes and fees at this juncture. Note that the stop in Frankfurt is not included in the Aeroplan round-the-world itinerary for 200K miles. From the above example, we can see that if you structure your flights efficiently, you can essentially recreate the same itinerary for about ½ the price in miles as Aeroplan’s Round-The-World itinerary. The mini round the world itinerary also allows you to have much more flexibility in your routing than would be allowed by Aeroplan’s. In general, the above example assumes flights in economy but there is definitely value in flying in a higher class of service on overseas flights. With the Aeroplan round the world itinerary, a higher class of service would cost significantly more (100K miles for each increase), but on an Asia award, an increase from economy to business would only cost 40K – 50K. In general, there is a significant increase in the level of service on longer flights. On short intra-Asia or intra-Europe flights, there is little advantage to flying in business or first class due to the short flights. If you feel this way, then you can book your main award in business and your intra-Asia and intra-Europe flights in economy. In the case of the example above, you would be able to fly the overseas portion in business and the short flights in economy and it would still cost you less than the Aeroplan round the world itinerary. The mini round the world itinerary also allows you to have much more flexibility in your routing than would be allowed by Aeroplan’s. I have shown that you can actually fly the long flights in First Class, and the short flights in Economy and that would cost the same as the Aeroplan Round-The-World itinerary. I have shown how to exploit the lax routing rules to recreate a round the world itinerary. There are situations when it actually would make sense to book Aeroplan’s version of the round the world. If you take the same principles that I have discussed here, there are ways to maximize your value on an Aeroplan Round The World ticket. Each “stopover” is costing you 40K in economy. Make sure to get 40K of value. Aeroplan allows for a mini round the world itinerary to be created due to the lax routing rules on allowing award tickets to transit the Pacific and Atlantic oceans on the same Asia awards. With this information, you can create your own itinerary to go around the world for the same price as an Asia award. Combine a main overseas mini round the world award with local flights to give you the same or similar itineraries to the Aeroplan round the world itineraries that cost twice as much. I’m trying to research the idea of using aeroplan miles for star alliance flights flying ORD-SEZ (open jaw) DUB-Montreal or maybe Copenhagen for a stopover – then on back to ORD. The Aeroplan website isn’t letting me do this, even if I try to do the stopover in one of the cities that is generated as a natural connection. One rep said it’s a limitation of the site, but another rep said that the open jaw “must be in between the two furthest points,” or in my case, DUB-ORD, which is 3600 miles, and when I added CPH as a stopover, the itinerary became invalid because I exceeded 3600 miles. Can anyone explain that rule to me? I think I’m getting confused by the furthest point rule in combination with the website limitation. Unfortuantely, you can only have an open-jaw OR a stopover on an Aeroplan ticket. This is why you are not able to get this ticketed (unless I understand you incorrectly). With respect to the open jaw rule, my understanding is that you can only throw out your shortest flight. For any Aeroplan award, you can only consider 3 destinnations, A-B//B-C//C-A. If you fly all 3 flights, then it would be the same as taking a stopover. If you want to make this an open jaw, you would throw out one of those flights. The restriction around which one you can throw out is limited to the shortest leg. That is a valid open-jaw. You have thrown out the (hidden) Montreal-Toronto leg and that is your shortest one. In this situation, you would be throwing out Vancouver-Toronto, which is not allowed since it is the long leg. I think this is to prevent people from opening up new routings by routing through the US. What I have described is essentially a one-way Toronto – Vancouver routing through Chicago, which is not allowed. Nice post! I have accumulate few aeroplan points now and I would like to use them next year as I want to take a year of … I like your Mini RTW hack, It might be a silly question but where do you book your Asia 1 flight (SIN-BKK BKK-HKG HKG-SIN)? I tried it on aeroplan website and it did not work. Thanks for the question. These ones that work according to the rules but Aeroplan.com wont book actually have to be booked by calling it in. Unfortunately Aeroplan makes you pay the phone fee. Advice: try to use Singapore airlines where possible on this routing. Your BKK – HKG will likely have to be on Thai and you are going to have to pay the fuel surcharge. Play around with it if you can route it to reduce your fuel surcharge. If you are really struggling to book an award and need some help, I do have the service where I can do the booking for you. Just click the “Award Travel Booking” link in the top left corner of the site. I think you have this one though. Aeroplan would not let me book the following itin because they said there are no stopovers allowed interasia.. From your mini RTW example above, it seems valid though. Thoughts? What are the rules for open jaw itineraries on domestic and trans-border travel? Your round-trip itinerary can only include one stopover or one open jaw, plus your point of turnaround. What about international itineraries with an open jaw and/or stopover? Online you may book an international round-trip itinerary including one stopover or one open jaw, plus your point of turnaround. The two cities making up the portion of your trip with no air travel must be in the same “travel zone”. Also, if your travel takes you within two reward levels, then the highest reward level applies. Did you have to phone in for the inter asia stopover flight, or was it bookable over the web? Unfortunately, you are going to have to call this one in. It seems Aeroplan.com doesnt want to price these out, unfortunately. That also means you need to find an agent who pushes it through. Re-visiting this, I would transfer my miles to US Airways and use those miles to book it if Aeroplan is being a pain (you avoid the $30 phone fee and lower your fuel surcharges which can get high if you are flying on Thai airways or ANA or Asiana). 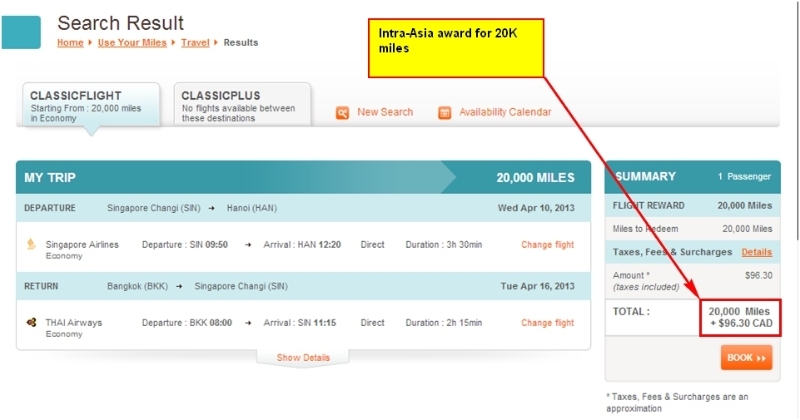 Aeroplan seems to be realy dropping the ball on Asia. I think in the same zone only one open-jaw is allowed. Forget about stopover. According to Aeroplan.com, you can still do a stopover within the same zone. I was able to do YYZ-YUL // YUL – YHZ // YHZ-YYZ and that was doable. What I recently found out is that you can actually do an open jaw AND a stopover for overseas flights, or 2 stopovers for those overseas flights. I am trying to plan a round the world as you described. When i called aeroplan they said i could book a second stopover as long as i booked with them and paid the 30 fee. I was booking Vancouver-Singapore -London Vancouver for only 75 and wanted to include Delhi. They said it could be my second stopover but would now be 100 as India was involved. Have you heard of this second free stopover? This was recently brought to my attention. Apparently you can have an extra stopover / open-jaw if you are in a different region. This would be great if you could exploit it for a free one-way flight, but I am not sure you can do that. “Is it possible to make a stopover with a ClassicFlight reward ticket? For Intercontinental travel (travel between two continents): Two stopovers are permitted in addition to the point of turnaround. One open jaw is permitted in lieu of one of the two stopovers. It seems that for the Asia and Europe continents, there are no stopovers allowed. Could you please comment on whether I am misunderstanding the rules and if it is still possible to do stopovers in the intra-asia and intra-europe as noted in your post above. Now, it is important to note that these rules are not enforced consistently. In fact, they are likely enforced to the detriment of the customer more often than not. I recently had a friend try to book a flight with a stopover that pretty much exactly matched the exampe of a “valid routing” and was told that this was not allowed. So just be aware that the rules are not enforced consistently. On a side note, it is strange that Aeroplan, as a loyalty program is great for certain things, one of which is the stopover rules within a zone. Given that Aeroplan doesnt even allow you to book your flight to take advantage of one of their greatest selling points, you have to wonder whether this is a program you want to invest a lot of your points in going forward. Just a thought. Great post! Wondering if you can help us out. We are a family of 5 planning a 10month trip in the next few years. We are trying to figure out what will be the best way to use our aeroplan miles vs paying out of pocket for other flights. We should have 700 000 to 800 000 aeroplan miles when we start traveling. We leave from Ottawa. We want to travel through eastern europe (we will travel by motorhome within Europe) then move on to Asia and then Africa before returning home. We start traveling in September so we were hoping to start in Europe then move to Asia in december then to Africa by march. This is rough so we are happy to hear suggestions to maximize our flight awards but keeping in mind the best times to travel in each areas. I would love to hear your suggestions if you have time. Thx! I can definitely help you out. We have a an award booking service. Why dont you fill in the information I need in the form and I can give you a response that way. Your main chart shows YYZ-SIN, YYZ-ZRH, ZRH-YYZ and that confused me initially. Would be nice to change it 🙂 How does one book a YYZ-SIN-ZRH-YYZ as a mini-round the world sector? SIN and ZRH are in two different zones, where as tickets are booked according to zones, that is YYZ to Asia, YYZ to Europe or was that multi-city. Sorry if I missed that. Actually, with Aeroplan, you get 2 stopovers or 1 stopover and 1 open-jaw as soon as its an international flight. We some help online, we just came back from a south america trip. Calgary – Mexico (six weeks) – then to Colombia Then open jaw back from Bolivia with an additional 23 hour layover in Mexico again. So 1 stopover and 1 open jaw.. Amazing. I’m trying to book YVR-TXL-HKG-YVR online. Why doesn’t it work? This should allow you to book it and if it isnt letting you then you are going to need to call Aeroplan. Just make sure that there is space available on the flights you wanted. If it is saying that this is not bookable or it is not a valid award or something like that you are going to have to call it in. 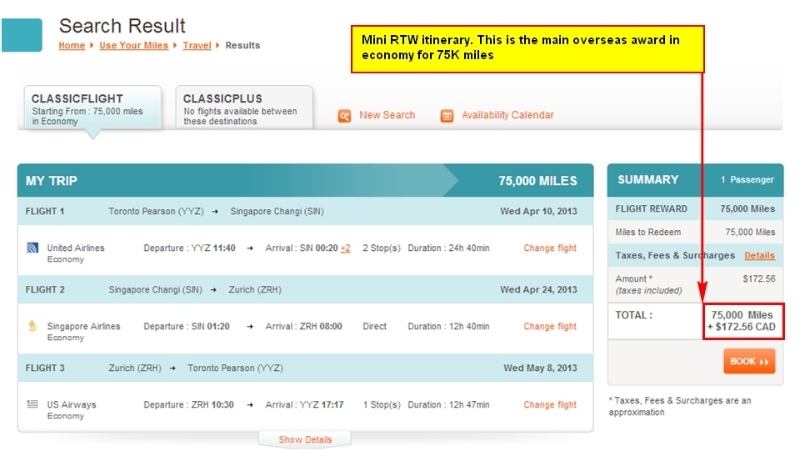 Unfortunately, Aeroplan.com is broken and there are many many valid itineraries that the website says are invalid. Your routing should be valid. Ottawa – Germany (no flights in europe) – asia (2-3 inner flights in asia) then to south america (1-2 inner flights in south america). we may need to go through new zealand to cross the pacific ocean. More specific examples of places we want to visit … ottawa – berlin (traveling by land through eastern europe) – nepal – beijing – singapour – vietnam – thailand – malysia – indonesia – possibly new zealand then peru, argentina and chile. we are traveling from sept to june. Any help would be greatly appreciated. we will be five people and approx. a total of 700-800 000 aeroplan miles to use. The rest will be purchased. THat is one heck of a trip you have planned. What you should do is try to target 3 “hub cities”, 1 in each of your continents. You can’t do any open jaws so you always have to return to “Zurich” for your onward flight. Your entry point to Europe has to be your exit poitn from Europe, and so on for all the continents. 1 Suggestion would be that if you are picking a city in any continent, choose the one that is in teh cheaper zone. ie Europe 1, Asia 1 and Northern South America so that you save miles. Ultimately, waht drives this should be the availability AND the taxes / fuel surcharges on your flights. For example using London, while nice, will likely add several hundreds of dollars in taxes to your itinerary over say, Zurich. I hoep that helps. email for further help. I want return ticket from Calgary to Delhi India. How much points I need in my account. North America to India is 100K in Economy + taxes / Fees. I’m Planning on going from Edmonton to China, and China to Italy, then back to Edmonton this summer. But I want to stop over in China for about One month, and spend another two months in Italy. You do not wnat to transfer those points as that comes with a fee. Ideally you will just get 75K (economy) in a singel account and then book your trip out of that one. The name of the aeroplan account owner does not need to match the passenger of the ticket. I believe that transfering from one person to another will constitute a fee of 2 cents / mile. If you are flying on economy and you need to transfer 25K miles from account A to account B, that will cost you $500+tax. My thoughts are that if you do this, you are likely going to end up paying more for your flight than if you were to just pay cash. If you are lfying in business then you may be able to make ti work out, but it is still a pricey endeavour. Having read the article about Aeroplan Hacking – The Mini RTW Ticket, I tried to follow (tested) what you said. For the Main award: overseas flights I managed to “book” it (i.e. it worked out ok). Bur for the Intra-Asia and Intra-Europe awards, Aeroplan persistently refuses my “booking” saying: “Your request is invalid and cannot be booked on one reward.”. Can anyone help to find out what is wrong? Try calling and hopefully they ticket it for you. Can you kindly confirm that if using ANA’s award ticket search I manage to find all the flights with “OK”, that means the flights are also acceptable to Aeroplan? 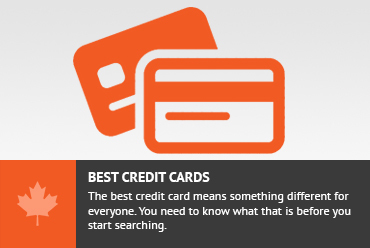 I tried and managed to find it works by using ANA award search (bur failed using Aeroplan). So my question to you actually is that if I copy the itinerary that works for ANA and ask Aeroplan to do same, it should work for me (because I am an Aeroplan member not ANA’s)? That is exactly correct. The ONLY thing you need to be sure of is that those flights that you are requesting are partners of Aeroplan as well. For example, ANA may route you on United and Singapore Air. Both of those are partners of Aeroplan so you can book them with aeroplan miles. However, if ANA is a partner of another carrier which Aeroplan is not a partner of, and ANA is suggesting you take that flight, then you will nto be able to book it using aeroplan miles. In general, the partners are very similar between ANA and Aeroplan so you should be fine. I am simply pointing out a situation where this may not hold true. In essence, ANA engine looks for bookable space across say 15 different airlines in one shot. That space is bookable using any partner airline. ANA is just checking many partners at once. IE ANA will identify that Singapore Air has space on flight x for partner awards. Aeroplan and ANA both have access to that space, even if Aeroplan.com might not show it. You call Aeroplan and tell them to book it because you know they can, even if the Aeroplan website is not workign to do this foryou. Impressive and in depth analysis on the Aeroplan program. It was timely as I was just about to start the process of booking the around the world trip with Aeroplan. Maybe I missed something, but I have a few questions for you. Based out in Calgary, I have direct flights to Tokyo, London, or Frankfurt. In the example above you used Asia1 as your overseas trip. To save points can I use Europe1 as my mini around the world trip instead (90k vs 150k)? I plan to take your advice and book business class for Europe1. My goal would be Calgary – London or Frankfurt// Lon or Frk – Singapore or Tokyo // Sing or Tok – Calgary. Plus book a mini 20-35k trip within the region. Would this be a legitimate trip in the eyes of aeroplan for 90k? Or would they require me to go over the pacific first, hence pay 150k instead of 90k points. Also how does having top status for both Air Canada and Aeroplan factor into this equation. I believe I get certain charges waived (feul), hence London would be cheaper for me?? You mentioned to avoid London at all costs because of extra charges. I really appreciate your help and thanks again for putting together this forum. I hope people appreciate what you’re doing here. I think I can answer your questions, if I understand them correctly. 1. Flying North America to Europe 1 to Asia 1 back to North America 1 is going to cost you the North America – Asia 1 price. It would be considered a North America to Asia 1, with a stopover in Europe 1 regardless of the direction. 2. The fuel surcharges / taxes are going to be levied based on the airline / destinations you are on. Taxes in London are very high so I suggest avoiding London unless London is somewhere you want to go. That being said, the airlines to avoid (as they have hefty surcharges) include Air Canada and Lufthansa. Target United and Swiss AIr for getting North America to Europe. In Asia, the surcharge free carriers include Singapore Air and Eva Air. I dont think that any status will help you to offset taxes or fuel surcharges on award tickets. Please correct me if I am wrong. Does this only work for a round trip ticket? Can I book multiple stop overs on a one way ticket? Stopovers are only allowed on roundtrip tickets. The current allowancce is actually 2 stopovers on any international roundtrip ticket. Aerolpan does not allow stopovers on one-way tickets. Don't subscribe All Replies to my comments Notify me of followup comments via e-mail. You can also <a href='https://www.creditwalk.ca/comment-subscriptions/?srp=599&srk=2648578ecea05c83754707575dc5a494&sra=s&srsrc=f'>subscribe</a> without commenting.